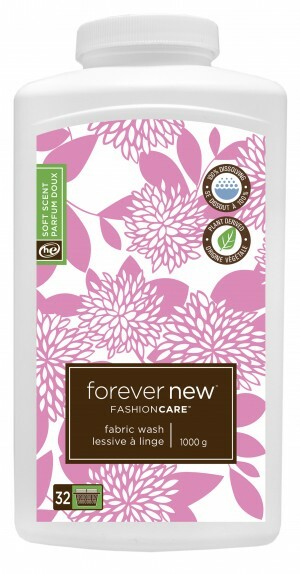 Forever New's pure citric base gently launders fibres without breaking them down and rinses so clean, everything looks newelonger. Preserves the fit and shape of modern fabrics (lingerie & hosiery, silk, wool, cotton, swimwear, and lycra). Removes residue from previous washings or dry cleaning. Designed for HE and standard washing machines as well as handwashing. A large bottle is good for at least 125 hand washes or 32 regular machine washes.